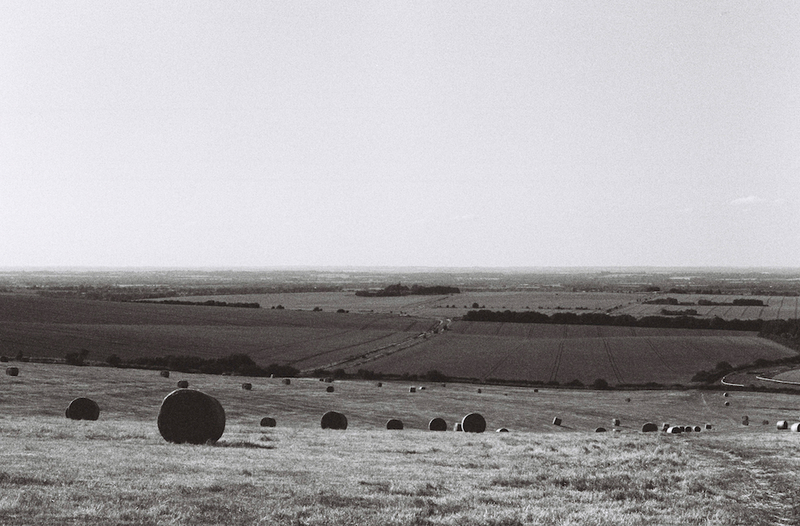 In memory of his grandfather, Nicholas Herrmann walks the length of The Ridgeway: an ancient road stretching for eighty-seven miles across chalk downland, from Overton Hill to Ivinghoe Beacon. We will be following Nicholas’ journey here on the Elsewhere blog over the next couple of months. There he sleeps, immeasurable: the fire-drake. Somewhere under the earth, in some hill or nameless barrow. His lair is dim and airless, his breast the only glow. His hide is painted in royal reds, scales edged in gold as if gilded with sticky treasures. Coiled around his mass: a tail tipped with a fleur-de-lis. His wings are folded at his sides, bat-like, all skin and sinew. Horns peek from a fog of smoke that spreads with every breath. Claws, blood-muddied, dig into countless piles of precious things. He could rise at any moment and burn the world away. The Ridgeway smells of dead grass and chapped earth. The fields creak with crickets, and Cabbage Whites drift on the breeze like ash. Our bags are heavy on our bare shoulders as we step into summer. We’ve unpacked our raincoats and drybags, filled the space with water and sun cream. It’s already hot as we pass the Memorial of Lord Wantage – a striking column rising from the ridge, proclaiming aphorisms in Latin across the valley: Peace in passing away. Salvation after death. Light after darkness. Hope in light. Somewhere, we cross into Berkshire, my home county. Soon, we’ll be wading into the Thames and resting in the Chilterns’ beechwood shade, but first we must traverse ten miles of parched and dying downland. A terrifying alchemy has taken place: the ‘precious stone set in the silver sea’ turned to dust. They’re calling it a heatwave. In the coming days, The Washington Post will run stories about the all-time records being set around the world: Africa and Japan witnessing their hottest ever temperatures, people dying in Canada, roads and roofs melting across the UK. The Jet Stream has buckled and the Gulf Stream is grinding to a halt, causing surface temperatures to rise. Whole sections of rivers vanish. Wildfires rage in the Arctic Circle. In Scotland, dogs die from lapping blooms of toxic algae. In Ireland and Wales, the drought causes crop marks to appear: outlines of ancient sites and settlements, unknown or long-lost, like marks from a magnifying glass burning through time. It’s Britain’s driest summer since modern records began. The heat is unnatural, the world uncomfortably warm. On the path, flies cluster and chase, attracted by our gathering sweat. We push through tall, tick-threatening grass, guessing at the names of the wildflowers that colour the verge. I can only identify the obvious ones: cow parsley, buttercups, thistles. A hiker heading for Overton Hill points out others: ragwort, scabius, vetch. Names like ancient ailments. My father has been clearing out John’s house in Wales, and there have been discussions about what to do with the dragons. They lurk on bookshelves beside Richard Mabey’s Flora Britannica, squat on side tables above leather walking boots. There’s a dragon cast in iron, low and long; one made of plastic, a children’s toy elevated to ornament; one carved into a wooden stamp. The centrepiece is ceramic, hand painted in green and gold, clutching a crystal ball. It was a love born of studying biology and archeology, reading Pratchett and Tolkien. Even the house was part of the collection in a way – a bolt hole in the land of the dragon. There’s no hiding from the heat. We’re stalked for miles by Didcot’s smoking towers. It’s a strange section of the trail, unremarkable and vast, the antithesis of Uffington, a place busy with history. We pass under the A34, connecting Newbury and Oxford like a steel pin forced through the bone of the land. The roaring underpass provides a few seconds of relief before we’re once again bombarded by UV rays. After another stretch, the landscape relaxes into a valley, the power station falling out of sight. At the bottom, a little brick bridge arches over a trench of nettles: the skeleton of the Didcot, Newbury and Southampton Railway, opened at the end of the nineteenth century, closed in the 1960s due to lack of traffic. The DN&SR became important in World War Two, when it was used to transport supplies to the coast in preparations for the Normandy landings. Our presence flusters a couple of wood pigeons that blunder into the trees. I lean on the wall and gaze into the green abyss, imagining the wildlife tucked into the weeds, the insects nesting in cracks, the creatures suspended in shadow. I wonder when the A34 will go this way – sink back into nature, burst open and bloom. Return to barbarism. The buzz of a Cessna interrupts the heavy quiet of the afternoon. The breeze is thick and warm, dragon’s breath blowing in from the barley. Orchids rise from the bank. Heat haze ribbons on every edge. As we trudge the last few miles, the chalk of the Ridgeway glows white-hot, angling the sun at us, cooking us evenly. I squint, chalkblind. Finally, we find shelter. A wood materialises on the lip of the Goring Gap as we descend the ridge. It’s a sign we’re moving through a new morphology now, that the windy, sweeping stretches of the North Wessex Downs are behind us. It also means we’re reaching the end of our first ancient highway, the Thames marking the start of the Icknield Way. We walk to the edge of Streatley, where a sign tells us we’ve been infalling for forty-one miles – almost half the distance to the Beacon. We see out the day at Aldworth, a village home to medieval giants, a one-thousand-year-old yew, and The Bell – the Platonic Form of a pub, housed in a building from the fifteenth century. We collapse onto rain-warped benches to savour local ciders beneath the falling sun. The temperature rises by one degree. Our skin a little pinker, we walk the final mile to Streatley. The town feels like a threshold, a red-brick terminal busy with early-risers leaving for the hills. There’s a book exchange in a telephone box, filled mostly with travel authors left by Ridgeway ramblers: Eric Newby, Paul Theroux, Patrick Leigh Fermor. We pass blue plaques announcing the famous feet that have graced the town: Turner did some sketches here, parts of The Wind in the Willows are set in the surrounds. Signposts ferry us over the Thames, into Goring, and through a system of alleyways and driveways that cut between castles: riverside mansions that block our view of the water. On the map, the path appears to follow the river closely, but in reality we’re funnelled between eight-foot-high fences, with signs warning: private, keep out, the river doesn’t belong to us. We emerge from the residential warren into a meadow of yellow wildflowers, ones I now have the power to name: ragwort. A train barrels past on its way to Reading. As we approach the perimeter of the village, church bells ringing the end of Sunday service, I’m put in mind of J.L. Carr’s A Month in the Country. This approach through no man’s land feels foreign, like we’re strolling into the early 1900s – the meadow hasn’t been cultivated, built upon, or swallowed up by Goring. It feels rare to find such a clear delineation, a place not being put to use. At last, we reach the river, sleepy and wide. Dogs stand in the shallows snapping at phantoms, people wave from paddleboards. We wander alongside, coming to a four-arched Victorian railway bridge I later learn was designed by Isambard Kingdom Brunel. The brickwork shows its age – wrinkled and weathered, bleached by efflorescence, mottled and soiled with moss and soot. Two centuries absorbed in its pores: every storm that’s ever fallen, every boat that’s passed underneath. 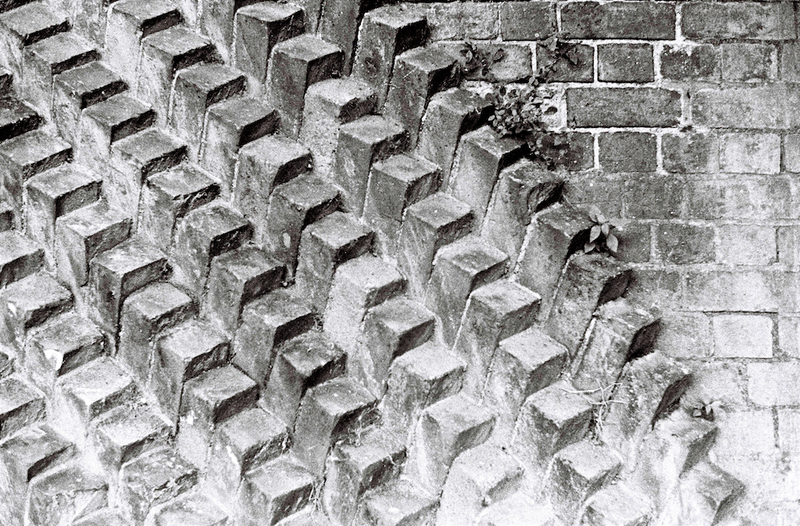 The bridge crosses the river aslant, the bricks arranged into complex diagonal structures. I linger to photograph an arch, mesmerised by its patterns and tones, the leaves and roots that sprout from the mortar. The years have given the bridge the same plumage as a kite. We follow the water north. It’s hazy, humid, the sun at its zenith. We are desperate to find a place to swim. Soon, we find it: the perfect beach just off the towpath. I take off my hat and shirt, and immediately begin to burn. We wade in. My toes sink into the silt, my blood starts to cool. We stand and listen to the buzz of insects and distant shouts down the river. A laugh from my father – fish are nibbling at his feet. When the sun becomes too much, I bend my knees and launch myself, washing the heat from my skin in an instant. I dive to wipe the sweat from my brow. The relief is profound. My limbs feel apart from me. Like eels, they slip and slither in the shadows of the river. I swim into the middle and float among the dragonflies. I breathe in the fishy smell of willow, weed and water. Like mudskippers, we climb out awkwardly, finding our feet on the sun-baked bank. I submerge my shirt before putting it on again, to carry the river with me a while. Then we head back into the long grass towards North Stoke. Where prayer has been valid. Lines from ‘Little Gidding’, the final part of T.S. Eliot’s Four Quartets. I stand in the nave clutching my notes, Eliot’s words ricocheting around my skull. Outside, the shadow of a kite orbits the churchyard, folding from stone to stone. Wagtails wash by the old mill, the path growing more secluded on the approach to Crowmarsh, a name perfectly suited to this terrain. We are travelling through edgeland now, a place not quite nature, not yet town: boggy, littered and overgrown. The scent of poplar and lime mix with car fumes that linger above the A4074 – a road that acts as a final boundary before we’re once again climbing into the hills. This is where we run out of water. My skin wrings out the last few drops as I snake down narrow, nettle-lined paths that wind between wheat fields belonging to Lonesome Farm. We pause on the edge of our first proper beech forest where the ferns are thick, the birdsong exotic and loud. The topography has shifted: shady, verdant, animate. Grim’s Ditch, a series of mysterious ancient earthworks we’ve been following for miles, grows deeper as we near Nuffield, like a dried up riverbed from some distant climatic tragedy. A red kite raises the alarm as we emerge from the trees: dragon-like, a lookout on the edge of its kingdom. The Church of the Holy Trinity, practiced in aiding walkers, supplies us with a bench and a tap. We fill our flasks and stomachs, water dripping from our chins. The kite whirls above us in the low light, sounding its battle cry: weee-ooh, ee oo ee oo ee oo. All the colours of heat. Nicholas Herrmann is a writer and photographer based in Bath. His work has appeared in journals and online, and his writing has been shortlisted for the Bath Novel Award and Janklow and Nesbit Prize. He is a graduate of the Creative Writing MA at Bath Spa University. He is currently working on his first novel. You can find him on Twitter: @NickPSH.